A number of changes were instigated in the program over the next year and a half, including designing a new hatch which opened outward and could be operated quickly, removing much of the flammable material and replacing it with self-extinguishing components, using a nitrogen-oxygen mixture at launch, and recording all changes and overseeing all modifications to the spacecraft design more rigorously. The changes made to the Apollo Command Module as a result of the tragedy resulted in a highly reliable craft which, with the exception of Apollo 13, helped make the complex and dangerous trip to the Moon almost commonplace. 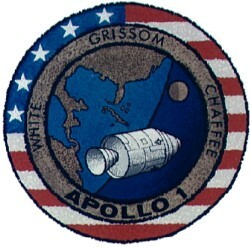 The eventual success of the Apollo program is a tribute to Gus Grissom, Ed White, and Roger Chafee, three fine astronauts whose tragic loss was not in vain. One of the worst tragedies in the history of spaceflight occurred on January 27, 1967 when the crew of Apollo 1 were killed in a fire in the Command Module during a preflight test at Cape Canaveral. 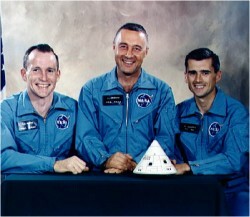 They were training for the first crewed Apollo flight, an Earth orbiting mission scheduled to be launched on 21 February. 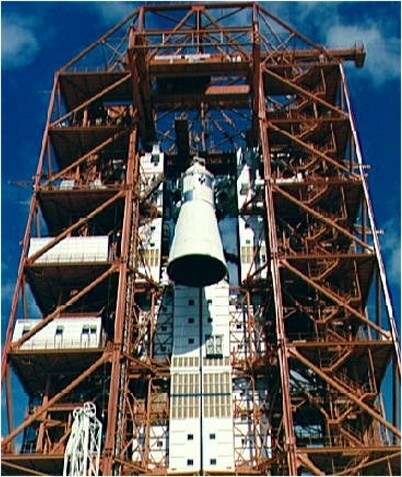 At 1 p.m. on Friday, 27 January 1967 the astronauts entered the capsule on Pad 34 to begin the test. A number of minor problems cropped up which delayed the test considerably and finally a failure in communications forced a hold in the count at 5:40 p.m. At 6:31 one of the astronauts (probably Chaffee) reported, "Fire, I smell fire." Two seconds later White was heard to say, "Fire in the cockpit." The Apollo hatch could only open inward and was held closed by a number of latches which had to be operated by ratchets. It took at least 90 seconds to get the hatch open under ideal conditions. Because the cabin had been filled with a pure oxygen atmosphere at normal pressure for the test and there had been many hours for the oxygen to permeate all the material in the cabin, the fire spread rapidly and the astronauts had no chance to get the hatch open. Nearby technicians tried to get to the hatch but were repeatedly driven back by the heat and smoke. By the time they succeeded in getting the hatch open, the astronauts had already perished due to smoke inhalation and burns. The Apollo program was put on hold while an exhaustive investigation was made of the accident. It was concluded that the most likely cause was a spark from a short circuit in a bundle of wires that ran to the left and just in front of Grissom's seat. The large amount of flammable material in the cabin in the oxygen environment allowed the fire to start and spread quickly.